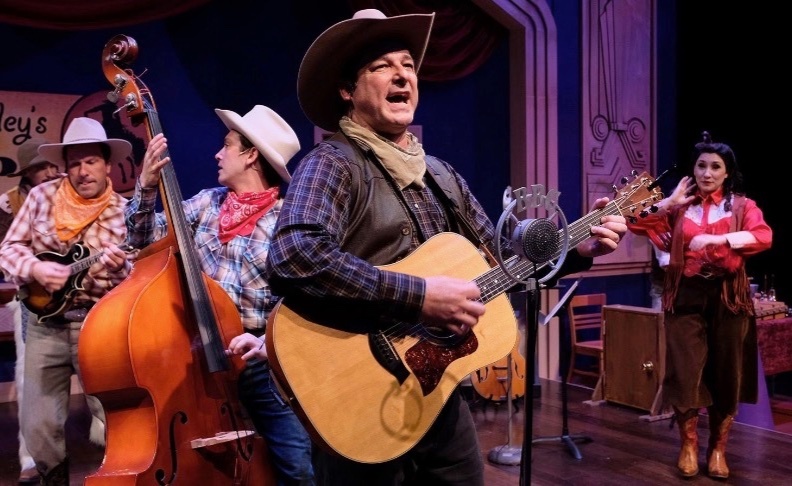 The era of the singing cowboy has gone the way of Roy Rogers, Gene Autry, Tex Owens, Son’s of the Pioneers and a host of others. To some there still is an air of nostalgia, especially when so many of the ‘songs’ -(“I’m An Old Cowhand”, “Tumblin Tumbleweeds”, “Ragtime Cowboy Joe”, “Cool Water”, “Back In The Saddle Again”, “Jingle Jangle Jingle” and “Cigarettes and Whisky and Cool Water”), that I remember had me a toe tappin’ and knee slappin’ throughout. Autry has a highway named after him, Rogers, a museum and both the as close as the ride to Palm Springs from San Diego. Although I never did stop into the Roy Rogers Museum, I did, as a kid, send a postcard into a contest to name Trigger’s (his horse) new pony. Those were the days. Lamb’s Players Theatre is mounting the Joanna Beecham, Malcolm Hillgartner’s 1959 British Comedy, “Chaps” in their Coronado Playhouse that for this production, has been transformed into a 1944 London Studio, Studio B at the BBC, through April 20th (Mike Buckley designed the set). 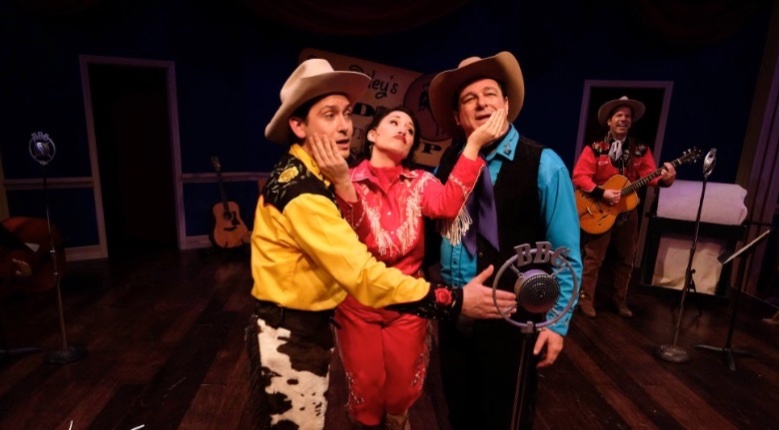 Director Robert Smyth calls this a ‘cowboy cabaret’, more like a cowboy musical revue with some very very silliness thrown in. 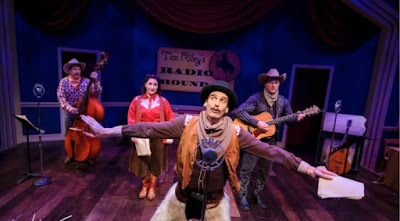 It seems the regular staff at Studio B: Archie Leitch (Steve Gouveia), sound man Stan (Arusi Santi), Miles Shadwell (Charles Evans, JR) announcer Lesley Briggs Stratton (Ross Hellwig) are anxiously waiting the arrival of ‘Tex Riley and His Radio Roundup” singers to entertain the troops on the front- (in foxholes in France, the fields of Belgium, and Holland and the hills of Italy), a gig planned for some time. Into the mix, Clive Cooper (Manny Fernandes) the next- door fish and chips owner (“Salty Fish and Chips”) happens in . He along along with the rest of the radio crew, are enlisted to ‘go on with the show’ when the singers are no where to be found. Confusion reigns, no one is ready for this and after some heavy twisting of arms, they resolve to give it a try. It seems tour manager Mabel Halliday (Grady) arrived at the station only to learn the guys never made it to the show. Conveniently, their trunks with costumes (Jeanne Reith) and some instruments did. Unfortunately the singing group was otherwise engaged; it seems they got lost. Stiff upper lip, and the crew at the BBC stand in and improvise for the missing musicians. They sing ballads and they harmonize. There is a male duet and a quartet and just about every other singing combination used to entertain along with a variety of comedy acts. Using the props and costumes from the trunk that put the Western into Western Music and changed a British radio crew with “Chaps” into Brits looking like a horse could gallop right through their legs, slap a ten gallon hat on their heads, and voila, we've got cowboys. The odd- looking blokes in their chaps and ten gallon hats sound like they had been singing right out of a Texas radio station all along. From a country western point of view they were all right as long as they twanged and Yippee-I-O-Ki-Yay’d, but challenges came up when juxtaposed with some off the wall British humor a la Monty Python (as advertised) that lands them in some REALLY? you want to go there? situations. Not to worry it all worked out in the end. Don’t read anything too serious into this fluff piece. It's pure entertainment. My recommendation is to sit back enjoy the voices and talent of this ensemble of six, and show appreciation especially to Stan (Santi) the sounds effects guy who doesn’t utter a sound but whose job it is to make sounds. He squeeze horns, claps coconut shells together to sound like galloping horses, slams doors, makes wind whistling breezes along with all those many wonderful tricks they did in the days of radio where no one could see the action, but could hear it. There are other laugh out loud moments as when Leslie (Hellwig) who stands over six feet comes Out in drag, painted face, lipstick and wig, wearing an off the shoulder (Jeanne Reith) dance hall ruffled dress with cowboy boots, and struts his stuff, or when there is a blackout and we hear "The William Tell Overture" –three times. More hysterics when Miles (Charles Evans, Jr.) dressed up as “Aces”, the little fellow with the wooden head, (think puppet) much resembling the Lord Farquaad look in Shrek. Unfortunately his head is pulled out from his body in a tug of war somehow, (‘Curly Joe From Idaho’) and Miles and Clive, the somewhat master of Aces, when all is said and done, are in full throttle comic mode banging out jokes and songs, one after another. (“Oh, Mary Anne”, “Oh Sally Jane Oh Sally Jane”, “I’ve Got Spurs That Jingle Jangle Jingle”.) Too funny for words. 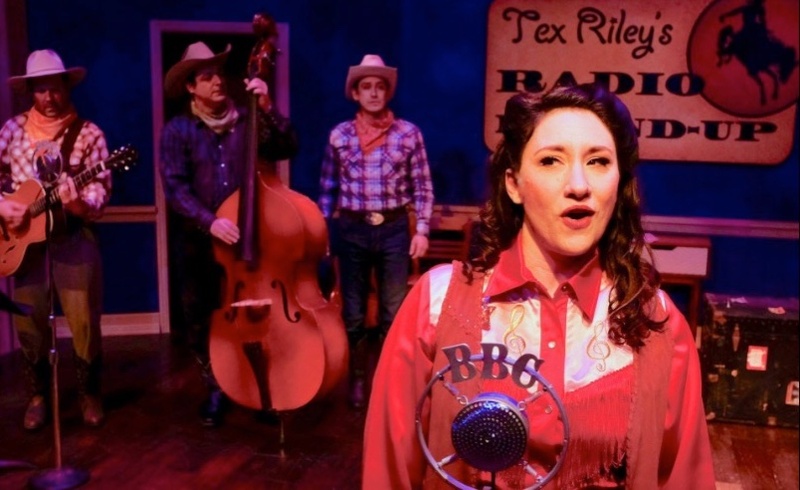 Catie Grady gives the production some well deserved balance in this all male show, singing duets, handing out scripts as to how the show should be, wishing her Yankee brother well wishes while fighting overseas and finally singing a beautiful rendition of “White Cliffs Of Dover”. As you can imagine, just as the radio show nears its end the real deals show up. That’s show biz for ya, and if you snooze, you loose. Credit Deborah Gilmour Smyth for choreography, Jon Lorenz for music direction, Nathan Peirson for lighting, and Patrick Duffy for sound and Rachel Hengst for properties. Saving the best for last, hats off to a well tuned musical cast who, from beginning to end sing, dance around, and play every instrument as it was their only. It always amazes the versatility and qualities of musicians that can pick up an instrument, in this case mostly strings, and and play as if it was their instrument of choice. Envious congratulations from one whose violin and guitar lessons were cut short for lack of showing any musical talent or finger coordination. Sigh!